3 Colors optional, Black/Red/Blue, Please choose the one you want. CNC Metal Material, More Durable and Beautiful! This is a ball head holder for GoPro camera module, need to meet the RAM of one inch sucker rod and ball sets or motorcycles, bicycles and other movable adjustable outriggers comprehensive easy to use and more intimate. 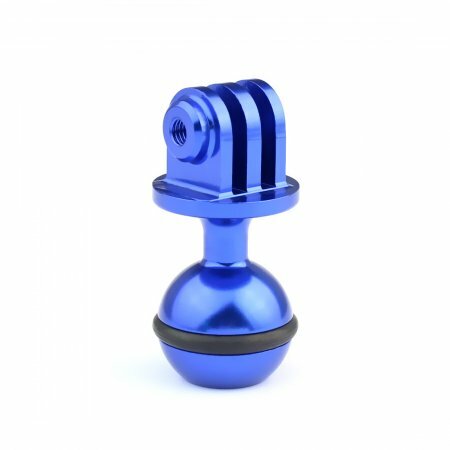 Designed for GoPro HERO3/3+/4/5 custom ball head mount. GoPro although there are supporting their own base and stand, but can not meet many outdoor players of high intensity, multi-functional needs. 4pcs/lot OEM Motor Guard Cap 3D..
6 in 1 CNC Aluminum 20mm Side Rail..
OEM Side Mount + Curved Adhesive..
OEM Aluminum Alloy Joint Diving..
Aluminum DSLR Camera Magic Arm..
OEM Bicycle Saddle Rail Seat Lock.. Fits for Fujifilm Fuji X-E1 X-E2..
3W TAROT TL2816-08 FPV Night..
OEM Aluminum Nut parts CNC..
CNC Aluminum 20mm Side Rail with..
6 Sets Carbon Fiber 16mm Tube CNC..
TAROT 16mm CNC ALL Metal electric..
F11409 TAROT 25mm CNC ALL Metal..
Cable Winder Aluminum Alloy DSLR..
CNC Aluminum Alloy Motor Mounting..
4X CNC Aluminium Alloy Motor Mount..
OEM Multi Color CNC Skydiving..
OEM Helmet Front Mount Bracket..
OEM 360 Degree Rotatable Aluminum..
OEM Tripod Mount Adapter Red For..
Z30 CNC Aluminum Folding Arm Tube..
OEM Blue CNC Skydiving Helmet..